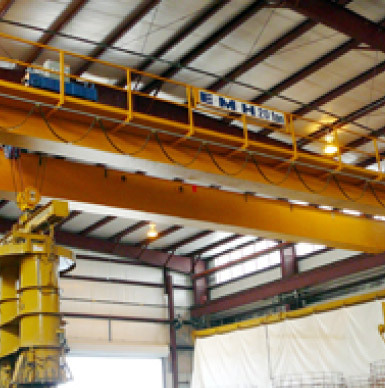 Free Standing Cranes | EMH, Inc.
EMH’s free standing cranes, the NOMAD® Free Standing Crane System is an ideal solution for when a standard overhead crane is impossible or impractical. These free standing cranes are also good for temporary crane installation. With a name like NOMAD, you know that EMH’s free standing cranes are designed with flexibility in mind as you can move them from spot to spot or site to site. These free standing cranes are also an excellent solution for pre-cast concrete buildings as all connections are bolted rather than welded. leasing your building? The NOMAD free standing crane can be moved from your temporary home to a more permanent locale. The NOMAD® free standing cranes also feature low headroom design to maximize lift when headroom is at a premium. Modular NOMAD® Free Standing Bridge Crane Cells are available in runway lengths of 20, 25 and 30 feet. Multiple cells can be combined for long runways; existing systems can be retrofitted with additional cells.